Today I nearly cried while making a turkey sandwich. It wasn’t the sandwich that caused the emotional reaction, but what it represented. You see, my now 18-year-old son (for whom I was making the sandwich) is graduating from high school in a few weeks, and this was the last time I would make his school lunch. Under normal circumstances, I would be elated. Despite years of practice, I never really mastered school lunches, and embraced half days as my days off from the brown bag routine. But this sandwich was different. I knew this day was coming - not the sandwich part of it - but the leaving. I feel like I’ve been getting phased out since my two kids, now 17 and 18, got their driver’s licenses, and stopped needing me for pretty much, well, anything. Still, this weeping-over-a-sandwich caught me by surprise. My first transition, 18 years ago. I remember when my son was about 10 days old and I went out for a run. After three months of bedrest, a day of labor and 10 days of recovery, I just could not wait any longer to hit the running trails. I needed some of my old life back. So I left my newborn with my capable husband and visiting mother, put on three giant nursing bras and some loose sweatpants, laced up and against doctor’s orders, went for a run. Along the path I came across two women - whom I did not know - but somehow I knew they had kids. They must have thought I was out of my mind because, out of breath, sweating profusely despite the November chill. I stopped them and literally asked, “When will my life go back to normal?” This whole motherhood thing was crazy - how did people do this? How would I survive the sleep deprivation, the loss of control, and the overwhelming knowledge that there was now a life that depended fully on me - me! - how? I think they kindly avoided giving me a direct answer - because the truth that all parents know is that it never goes back to normal. But I ended up loving my new normal much more. I embraced it so much that after we welcomed our second child fourteen months later, I happily left my paying job to be home with the two babies. Being their mom was the best job I ever had. And now, 18 years later, I am about to be laid off. Now, I want to find those women again and ask them, “When, oh when, will I ever feel right again?” Did I get so comfortable in the nest that now I can’t even imagine what it will be like without my kids in it? Don’t get me wrong, I am thrilled for both of my kids to begin their next chapter, which is well defined for them: college. I am just not sure what my next chapter is, and maybe that’s the problem. My days had been tethered by the mostly wonderful and sometimes mundane tasks of raising kids, from carpools to preschool schedules and PTA meetings to nightly readings of Go Dog Go. There were family dinners and hikes, trekking all over the eastern seaboard for track meets and basketball games, and advising on college decisions. But suddenly, things feel rather vacant and unfocused. I need to find structure and meaning and purpose again. I need to find me again. My identity, psychologists say, is wrapped up in being a mom, and it’s time for me to branch out and get a new life of my own. In my head, I know this. But my heart still breaks to know that my role in both of my children’s lives will soon be diminished, as it should be. “You are about to sustain an emotional injury,” he told me when we spoke, which explains my near physical pain and paralysis when I consider my future. “The parenting role took up such a big part of your life. It’s really now almost starting from scratch - it can be very challenging, very anxiety provoking and it can be very bewildering because a lot of people at that point in their lives don’t know really where to start.” Bingo. Yes, my affliction is twofold: a whole lot of heartbreak and a good dose of existential crisis. My children are moving out and they are taking my identity with them. Along the journey of raising my kids, I may have forgotten that the goal was to nurture them into independent, self-sustaining adults. But where does that leave me? My own mother handled both my brother’s transition - and my own - perfectly. A stay-at-home mom during the 1970’s, she went back and finished her college degree when my brother and I were school aged, then got her masters right around the time I graduated from high school. I was off to college, and she was starting her own business in historic preservation. In retrospect, her plan was genius. Advice from moms who’ve been there. While I couldn’t go back and find those two women from the running trail eighteen years ago, I decided to ask other smart women in my life how they coped, recovered and reinvented after their kids left the nest. I found their words comforting and inspiring, and I wanted to share some of their wisdom, and more of Melissa Shultz’s. Start early: Visualize the change to prepare yourself. Focus on you and flex your new empty nest life. This is not the end of parenting, it is a shift. When the first one leaves, the family dynamic changes in surprising ways. Marriages go through an adjustment period, too. Celebrate because there is less laundry and you can finally clean out their room. Our biggest milestones are coming up. 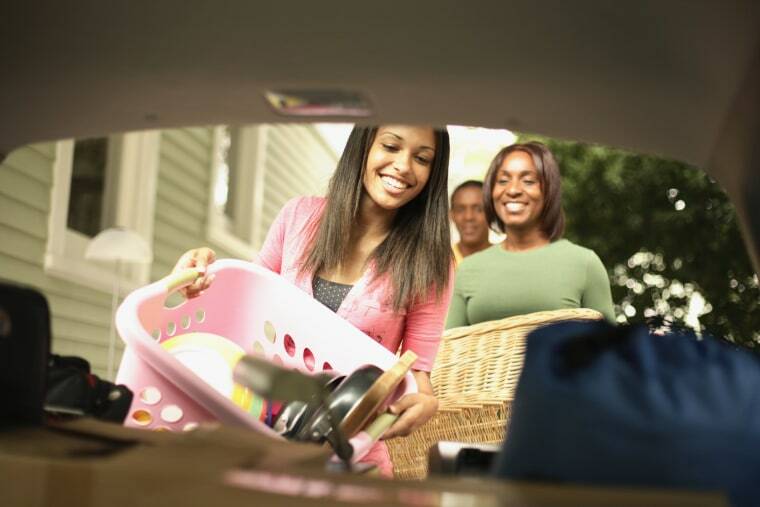 My son’s college drop off is in August (Melissa Shultz says don’t look back as you drive away.) I am looking forward to my daughter’s senior year of high school, and the opportunity to get to know her in a new way. All of us - my son, daughter and husband – have been going through this transition together, getting teary from time to time, but I am beginning to be hopeful and excited about a new beginning. I’m getting ready to flex my own empty nest wings. It’s time. By Ginny Brzezinski Ginny Brzezinski is Know Your Value's Comeback Career contributor. She and Mika Brzezinski are co-authoring a book for women re-entering the workforce, which will be released in September 2019. Connect with Ginny on LinkedIn. Read more about Ginny here.